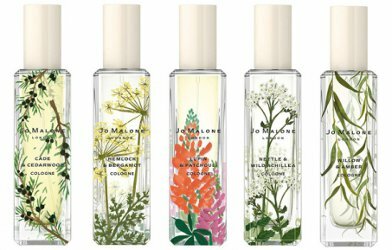 Jo Malone will launch Wild Flowers & Weeds, a new limited edition collection of five fragrances (Cade & Cedarwood, Hemlock & Bergamot, Lupin & Patchouli, Nettle & Wild Achillea and Willow & Amber), in March. Wild Flowers & Weeds follows 2017's The Bloomsbury Set and 2018's English Fields. Cade & Cedarwood ~ smoky woods with vanilla. Hemlock & Bergamot ~ powdery but crisp, with mimosa, heliotrope and cucumber. Lupin & Patchouli ~ with mandarin and rose. Nettle & Wild Achillea ~ green, with bergamot and white musk. Willow & Amber ~ soft, with cashmere wood and vetiver. Jo Malone Wild Flowers & Weeds Cade & Cedarwood, Hemlock & Bergamot, Lupin & Patchouli, Nettle & Wild Achillea and Willow & Amber will be available in 30 ml Cologne. They were developed by perfumers Yann Vasnier and Louise Turner. I would rather have one of these bottles than the jeweled cap ones. Aesthetic wise. They are really pretty. I never end up liking any of them, but they’re darned pretty. Lupin is one of my favourite scents, it reminds me of a cross between clover ( peppery honey pollen) and broom ( pollen but fresher ). Just love it. Wild achillea is yarrow which grows everywhere on my hill. It is quite bitter and herbal if you crush the tips, leaves and stem…good for seeping in hot water and drinking as tea. I have been searching for a willow perfume for a while even though , to be honest, i just get a green leaf smell from willow leaves. I think willow needs the kind of visual image of slow moving rivers, lazy days etc. to capture the imagination and make the scent come alive. I think the Lupin scent woukd be the one I might end up blind buying though it might just be like a version of mimosa? Wish JM was in my town. Sounds from reading various blogs like Willow & Amber is mostly a light cashmeran. Thanks. With a few exceptions JM serves the role of background music for me. Fills a void , mostly goes unnoticed but every now and again captures my attention and causes me to stop and listen ( translated into perfume …..maybe flowers in a vase on the table is a better comparison ). I have quite a lot of JM but only really love the English Fields. No mention of these at all on the JM website. You’d think they’d be promoting them as “coming soon” or pre-order. I want a sampler. Oh dear. Trying to resist the call of the lemming … I love the bottles, and the scents sound appealing! Those bottles! 😍 Based on the listed notes alone, Hemlock and Bergamot could potentially be of interest, but it’s rare I fall for a Jo Malone. The only perfume I’ve tried from their last two collections was Honey and Crocus, which is very nice. I really loath going to the jam packed downtown Seattle Nordstrom, but I may be tempted to go sniff these out if they make it there.